When it comes to running a school, principals are just as important as the multitude of teaching faculty. This holds especially true for middle school principals, who possess responsibilities a bit different from any other educational level. The ideal middle school principal will be able to direct their faculty in terms of how to best meet the student body’s educational needs, as well as help to guide the students themselves. If you are trying to become an Oklahoman middle school principal, you know you have numerous hurdles to clear before you can lead a school. One of them is the OSAT Middle Level Principal Comprehensive Assessment test. This test, like so many others, is meant to gauge how ready you are to work as a middle school principal. It assesses you on all of the knowledge you will need to possess for the job. Earning a passing score will allow you to finally enter your field as a professional. We at Mometrix Test Preparation understand just how important this exam is to your future career goals. 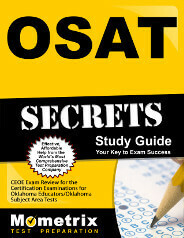 To help, we want to offer you our OSAT Middle Level Principal Comprehensive Assessment (046) practice test. We recommend this resource to anyone looking to gain a deeper glimpse of what to expect from the test. 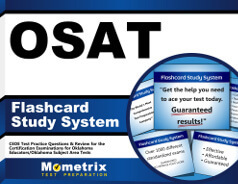 Through careful research, we have designed a study tool that perfectly mirrors the original OSAT test for your field in terms in structure and material. The real test is split into two answer categories which totals 52 OSAT Middle Level Principal Comprehensive Assessment questions. Approximately 30 percent of the exam is composed of essay questions, otherwise known as “constructed-response.” There are two questions under this category, one counting 20 percent and the other 10 percent, both of them pertaining to the subject of Educational Leadership. For a more thorough study experience, we recommend pairing this OSAT Middle Level Principal Comprehensive Assessment practice test with our study guide. Good luck!